the TEXAS FRESHWATER FISHERIES CENTER at Athens, Texas. 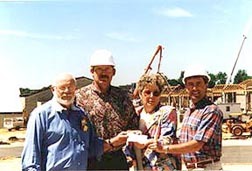 Leonard Ranne, President of TBBU and David Campbell, Hatchery Manager for the Fisheries Center are shown accepting a check for $2,100 from KCKL Operations Manager Pat Isaacson, and Tournament Director Mike McBurney. 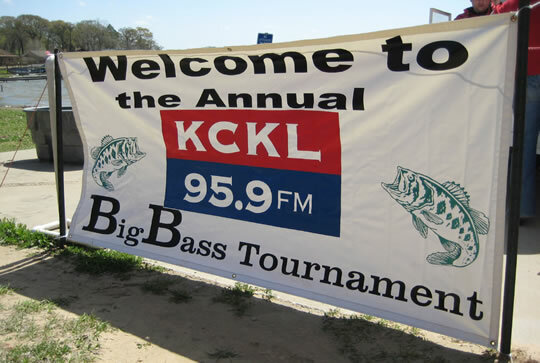 This contribution marks the second year that TBBU and the Athens Center have been the beneficiary of the fisheries conservation fundraising activites conducted in conjunction with the annual KCKL Bass Tournament at Cedar Creek Lake. Also, the 1996 Tournament winning fish, a 13.30 lb. beauty, was accepted into the State Share-A-Lunker hatchery program. Rickey Prince landed the Lake Record of 14.65 lbs while fishing off his dock!